Writing test scores indicate that boys have fallen far behind girls across the grades. In general, boys don't enjoy writing as much as girls. What's wrong? How can we do a better of job of creating "boy-friendly" classrooms so their voices can be heard? 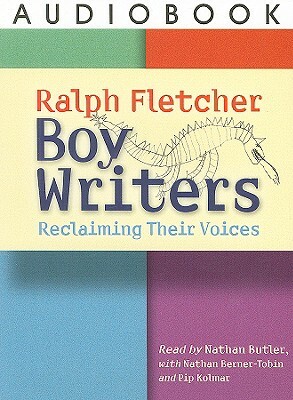 In Boy Writers: Reclaiming Their Voices Ralph Fletcher draws upon his years of experience as staff developer, children's book author, and father of four boys. He also taps the insights from dozens of writing teachers around the US and abroad. Boy Writers asks teachers to imagine the writing classroom from a boy's perspective, and consider specific steps we might take to create stimulating classrooms for boys. What subjects are boy writers passionate about, and what motivates them as writers? Why do boys like to incorporate violence into their stories, and how much should be allowed? Why do we so often misread and misunderstand the humor boys include in their stories? In addition, the book looks at: how handwriting can hamstring boy writers, and how drawing may help; welcoming boy-friendly writing genres in our classrooms; ways to improve our conferring with boys; and more. Each chapter begins with a thorough discussion of a topic and ends with a highly practical section titled: "What can I do in my classroom?" Boy Writers does not advocate promoting the interests of boys at the expense of girls. Rather, it argues that developing sensitivity to the unique facets of boy writers will help teachers better address the needs of all their students.